Fourteen artifacts from the collection of Peter O’Malley, Dodger president from 1970-1998, will be featured in a special exhibition “Baseball in Japan and the O’Malley Family: A Lasting Friendship” at the Baseball Hall of Fame and Museum in Tokyo, Japan from June 29-July 15. The Hall of Fame will also display several items from its collection, including the 1988 Dodger World Championship ring and a jersey worn by Akihiro “Ike” Ikuhara, a graduate of Tokyo’s Waseda University. He was hired by the Dodgers in 1965 and later became assistant to Dodger President O’Malley. Ikuhara, instrumental in furthering international and Olympic baseball, was posthumously inducted into the Japan Hall of Fame in 2002. As a young man, O’Malley made his first trip to Japan with his family on the Dodgers’ 1956 Goodwill Tour. Dodger owner Walter O’Malley had arranged for the Dodgers to play 19 exhibition games throughout the country in an agreement with Matsutaro Shoriki, publisher of the Yomiuri Shimbun and the “father” of professional baseball in Japan. For the first time, O’Malley is publicly exhibiting a porcelain hand-painted Noritake plate with Mt. Fuji in the background. 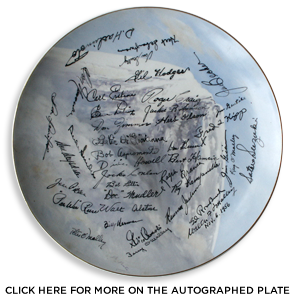 Signed during the Dodgers’ 1956 Goodwill Tour to Japan, this one-of-a-kind item features 40 bold autographs of players and their traveling party. Eleven Hall of Fame members are on the plate, including 10 from the National Baseball Hall of Fame in Cooperstown, NY, and one from the Japan Baseball Hall of Fame. Jackie Robinson, one of the signees, broke baseball’s color barrier in 1947 and made his final appearance in a Dodger uniform during the 1956 Goodwill Tour. 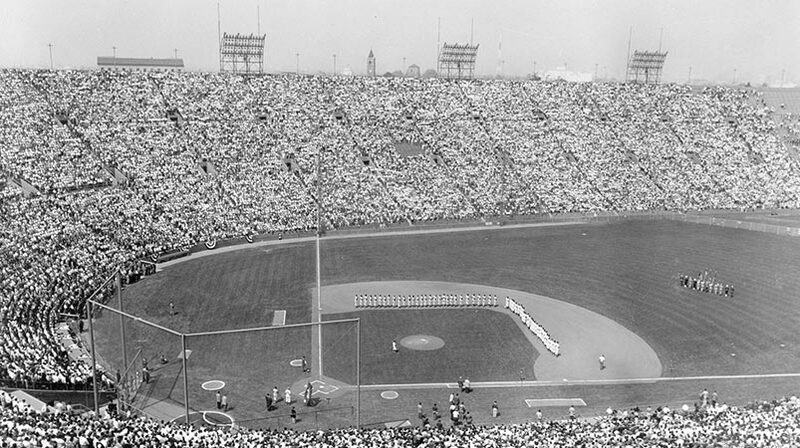 On November 1, 1956, prior to the game at Hiroshima Stadium, Dodger executives and players participated in emotional ceremonies to dedicate to the city a bronze plaque at the entrance of the ballpark. Inscribed on the plaque were the words, “We dedicate this visit in memory of those baseball fans and others who here died by atomic action on Aug. 6, 1945. May their souls rest in peace and with God’s help and man’s resolution peace will prevail forever, amen.” A replica of that plaque, along with original autographs of 29 players and members of the traveling party, will be displayed during the exhibit. Also to be displayed is a framed collection of eight autographed baseballs representing each of the participating countries from the 1984 Olympic Games exhibition tournament at Dodger Stadium. Japan defeated the United States in the championship game of the sold-out tournament. The Dodgers’ historic 1995 signing of pitcher Hideo Nomo, who was the first Japanese-born player to appear in Major League Baseball from Japan’s Central or Pacific Leagues since Masanori Murakami in 1965, will be celebrated in the exhibit with a personally inscribed photograph to O’Malley. Nomo won 1995 National League Rookie of the Year honors for the Dodgers and opened the door to MLB for more than 40 other Japanese players. The exhibit celebrates the 110th anniversary of the 1903 birth of Walter O’Malley, who was inducted into the National Baseball Hall of Fame and Museum in Cooperstown, NY, in 2008. The O’Malley family arranged for three Dodger friendship tours to Japan: 1956, 1966 and 1993. During the 1966 trip, Walter O’Malley was presented at the Prime Minister’s office with the Order of the Sacred Treasure Gold Rays with Neck Ribbon, a high honor for a non-Japanese, in recognition of fostering United States-Japan friendship through professional baseball. The medal, conferred by Emperor Hirohito, will be part of the exhibit. In addition, three different Happi coats presented to the Dodger traveling party during the 1966 Goodwill Tour will be displayed. On one colorful coat, the Japanese wording reads, “Welcome, World Peace, Dodgers”. The more than 55-year relationship between the O’Malley family and Japan includes the Yomiuri Giants training at Dodgertown in Vero Beach, FL (the Dodgers’ spring training home from 1948-2008) in 1961, 1967, 1971, 1975 and 1981. Following the 1956 Goodwill Tour to Japan, Dodger owner Walter O’Malley invited Yomiuri pitcher Sho Horiuchi and catcher Shigeru Fujio to Dodgertown in spring 1957, along with Shigeru Mizuhara, manager of the Giants (a Japan Hall of Fame inductee) and renowned sports writer Sotaro Suzuki (a Japan Hall of Fame inductee), the first of many visits to follow. In 1988, the Chunichi Dragons visited Dodgertown and, in 1994, Waseda University from Tokyo, Japan, was the first amateur baseball team to be invited to train. For two weeks, they practiced alongside the Dodgers. Through the years, the Dodgers have conducted numerous exchanges both in Japan and in the United States involving players, coaches, medical personnel, scouts and executives.